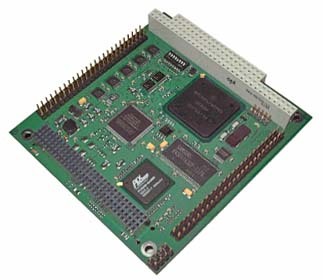 The PATI is a highly integrated I/O Board in PC/104-Plus form factor. Build around the MPC555 Motorola PowerPCTM Processor and the PLX9056 PCI Bridge it brings the superb MPC555 peripherals to a standard PCI Interface. With the possibilities for firmware update over the PCI bus, parameter passing via the on-board SDRAM, allowing the PATI to access the host memory via PCI busmaster access and various configurations options it is well suited for fast prototyping application. A stand-alone mode allows the PATI to work without the host. Application developed and tested in a host environment can be executed on the PATI in the stand-alone mode without any code modification. PATI-Cx Customer specific versions, please contact MPL for details. For deployment in harsh environments, the PATI can be ordered in an extended temperature version. Every system needs to pass various tests in a climate chamber to prove that it will perform flawless over the temperature range indicated.